Long range transport of atmospheric pollutants and aerosol-cloud interaction. To clarify the effect of aerosols on air pollution and climate change, the ASRD will observe atmospheric pollutants in the urban, mountain, and maritime atmospheres. 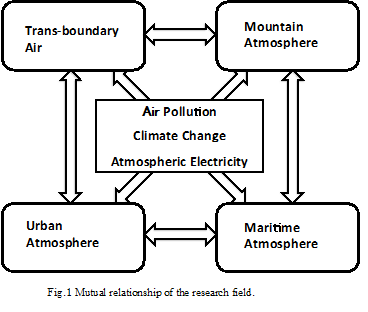 ASRD is the division to carry out research on air pollution and climate change by observation in the urban air, the maritime air, the mountain air, and trans-boundary air (Fig. 1). ASRD has twenty members. Their roles and observation sites are shown in Fig. 2. Fig. 2 Roles of ASRD members and their observation sites, mountain (red) and surface (blue) sites. Concentration of PM2.5 has decreased by diesel car emission controls considerably in South Kanto, but an achievement of environmental standard rate of PM2.5 is still low. The possibility of the transported pollution is considered as this cause, but PM2.5 occurs not a thing growing only in China anywhere. Because the particles are removed from all over the atmosphere if there is rainfall during transportation, it is thought that the long-range transportation from the continent is performed in the free troposphere. Therefore we get cooperation of the authorized nonprofit organization ‘Valid Utilization of Mt. Fuji Weather Station’ (http://npo.fuji3776.net/) and observe it at the old Mt. Fuji Weather Station at the summit of Mt. Fuji and study the condition that PM2.5 becomes high concentration. In addition, the hygroscopic aerosol particle can cause the high density of PM2.5. Therefore, by observation using Tokyo Bay or a ship, I investigate the influence of the marine atmosphere aerosol particle. Changes in the atmospheric abundance of greenhouse gases and aerosols, in solar radiation and in land surface properties alter the energy balance on the climate system (IPCC2013). Aerosols affect the climate both directly (by scattering and absorbing radiation) and indirectly (by serving as nuclei for cloud formation). These effects remain the dominant uncertainty in radiative forcing. surfaces for heterogeneous chemical reactions with sulphur or organic gases. There are a few papers of new particle production observed in the PBL under a highpressure system. It suggests that particles are produced in the free troposphere (FT). interactions. Our station on Mt. Fuji is particularly important, as Fuji is an isolated peak normally situated in the FT. 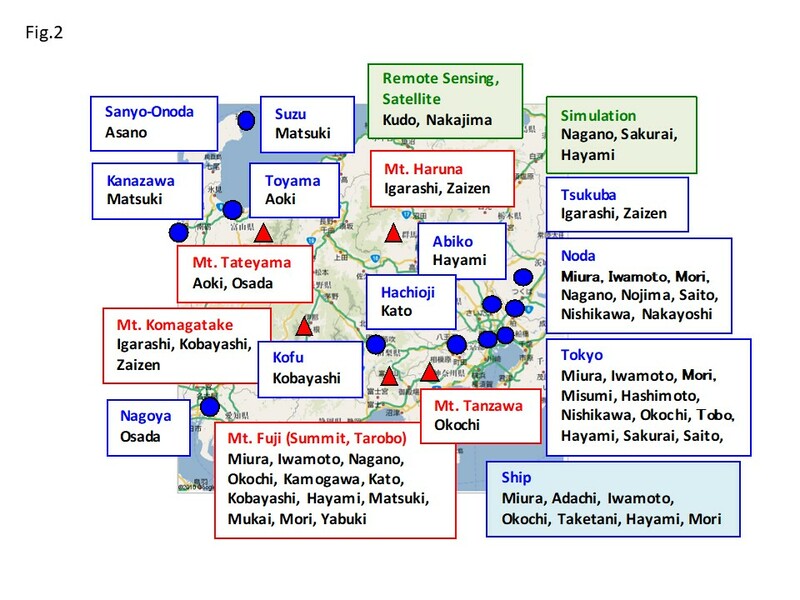 Furthermore, by using the Tokyo Skytree and the research vessel, we investigate the characteristic of aerosol particles in the urban and maritime atmosphere (Fig. 3 ). The ASRD will activate the collaborated research and make the network of Japanese atmosphere observatory. ASRD is the division to carry out research on air pollution and climate change by observation in the urban air, the ocean air, and the mountain air. 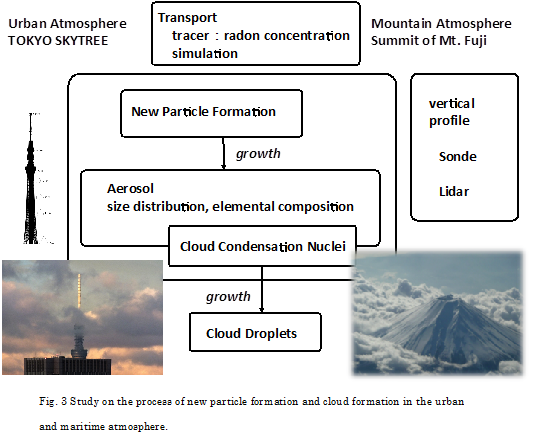 We study the processes of new particle formation, particle growth, and cloud formation at the Tokyo Skytree and at the summit of Mt. Fuji. We will study the mixture effects of maritime and urban aerosols by sea and land breeze.